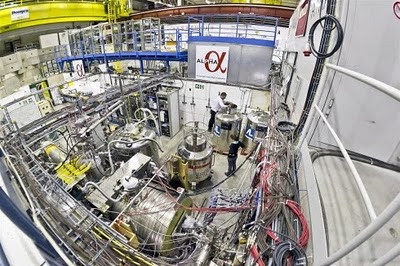 Researchers announced this week that for the first time they have created and trapped 38 anti-atoms at the CERN laboratory in Geneva, Switzerland. When a regular atom and an anti-atom meet they annihilate each other, creating a burst of energy. This effect is used on the television program "Star Trek" to accelerate a starship to high speeds. In real life, anti-atoms can be created -- but only in tiny amounts. Anti-atoms are very scarce in the universe, as far as we know. Indeed, astronomers see little evidence of anti-atoms in the great depths of space. To see them at all anti-atoms have to be made here on Earth at particle accelerators. The trouble is that as soon as you make an anti-atom it drifts away before you can study it. Only with this new announcement can physicists say that they have properly held even a handful of these difficult particles in one place under controllable conditions. Understanding why there is so much matter but so little antimatter is one of the most pressing issues in science. One way of studying this issue is to make antimatter in the lab. The simplest conventional atom is the hydrogen atom. It consists of a heavy, positively charged particle called a proton, wedded to a light, negatively charged particle called an electron. Hydrogen is the most abundant element in the universe. Our bodies contain a lot of it, and it participates in myriad chemical reactions such as the digestion of food and the combustion of gasoline. An anti-hydrogen atom is just as simple, but is harder to come by. It consists of a heavy, negatively charged particle, the antiproton, wedded to a light, positively charged particle, a positron -- the usual name for an anti-electron. Positrons can be obtained from the radioactive decay of certain elements. Obtaining large numbers of anti-protons is the hard part. First, regular protons must be accelerated to high speeds and smashed into a metal target. These collisions sometimes result in the creation of proton-antiproton pairs, as if they were contrasting twin brothers -- one normal and one anti. The antiprotons are collected into a separate beam, and then deliberately slowed down. This is ironic since at accelerators the goal is usually to speed particles up. CERN -- the French acronym for the European Organization for Nuclear Research -- is home to the Large Hadron Collider, where acceleration is indeed the theme. But when it comes to antiproton experiments, CERN undertakes a dramatic deceleration. The energy of the antiprotons zipping around deep-underground tunnels is reduced from billions of electron volts, to millions, to thousands, and so forth -- on down to a fraction of an electron volt. According to one of the researchers, Jeffrey Hangst from Aarhus University in Denmark, this is equivalent to cooling the particles from a temperature of 10 trillion degrees to half a degree above absolute zero. The next tricky step in making anti-atoms is to coax the antiprotons into linking up with the positrons. Slowing these particles to the lowest possible temperatures increases the chances that they will meet and mate. Several experimental groups at CERN have accomplished this, including one called ALPHA and another deemed ATRAP. The next step is to hold the newly-made anti-atoms in one place. You can't just hold anti-atoms in a conventional bottle since as soon as they come close to a regular atom the two will undergo a mutual annihilation. Therefore, scientists attempt to keep the anti-atoms poised in space using a sophisticated arrangement of magnetic forces. The ALPHA group is reporting in this week's issue of the journal Nature that they have finally trapped the anti-atoms. Why did they succeed in getting the anti-hydrogen to say put? "There isn't one single innovation; there were lots of them that add up to success," said Hangst, who is the spokesman for ALPHA. The innovations included a special magnet, an improved system for cooling the particles, and a delicate sensor for observing the annihilations that occur when the anti-atoms are finally released from their trap and allowed to drift into the surrounding material. The ALPHA group observed evidence for 38 anti-hydrogen atoms in their trap. The next step will be to accumulate even more atoms and then to study them in detail. One direct approach is to see if the set of internal energy levels -- the energy spectrum -- of anti-hydrogen is identical to that of hydrogen. If the two species of atoms differ, then some new form of physics would be operating. Physicists find that prospect very exciting. Gerald Gabrielse of Harvard University in Cambridge, Mass., is the head of the ATRAP group. In an article posted on Nov. 16 in the journal Physical Review Letters, Gabrielse and his colleagues report on a new method for collecting and cooling antiprotons. Although they have not yet been able to trap anti-atoms, they believe that with their new cooling methods they will soon be able to make and trap anti-atoms hundreds or thousands at a time, and at still colder temperatures. "When in 1987 I first proposed the magnetic trapping of cold anti-hydrogen that was formed from cold trapped antiprotons and positrons I never imagined that 4 substantial international teams would be pursuing the cold anti-hydrogen dream at a storage ring built at CERN for this," Gabrielse said. "I am excited and proud of the 38 atoms that appear to have been fleetingly trapped since they are the latest step towards realizing the dream. Hopefully what we learn from a few atoms will speed us toward accumulating enough trapped anti-hydrogen atoms for precise laser spectroscopy." Having a picture of Gerry Gabrielse, head of the rival ATRAP collaboration, to head a story about the success of the ALPHA collaboration, is a gross editing error. Good point. Sorry about that. I got my files mixed up.